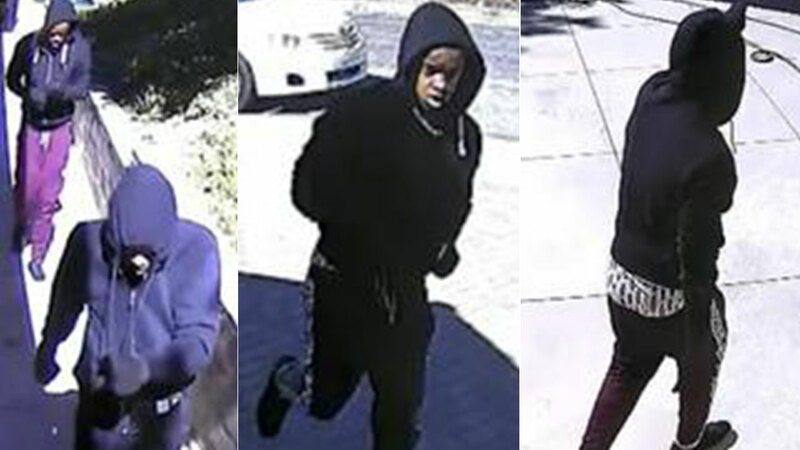 Monterey Park police are looking for two suspects who tried to break into a home during the daytime Tuesday but fled when an alarm was activated. MONTEREY PARK, Calif. (KABC) -- Monterey Park police are looking for two suspects who tried to break into a home during the daytime Tuesday but fled when an alarm was activated. A man and woman, both believed to be in their 20s, were captured on surveillance footage jumping the gate of a home in the 1400 block of Sombrero Drive around noon Tuesday. They walked up to the back and opened a sliding glass door. But an alarm went off and the two were seen fleeing in a white Toyota Camry, with dark tinted windows, no front license plate and possibly a rear paper plate. Police say another resident of the neighborhood reported a woman around the same time had walked up to her door and asked for "Ashley," and then left in a white Toyota sedan. Police described the first suspect as an African-American male, around 20-25 years old, about 5 foot 10 to 6 feet tall, with a thin build and weighing about 160-180 pounds. He was wearing a black hoodie with a white Air Jordan logo on the back, with black pants, multi-colored high top Vans SK8-Hi Pro Thrasher Skate shoes and black gloves. The second suspect was described as an African-American female, 20-30 years old, from 5 foot 5 to 6 feet, with a thin build and weighing 110-130 pounds, wearing a black hooded sweatshirt, burgundy pants, black basketball shoes and black gloves. Police believe there was a third suspect driving the vehicle, but no description was available.